Rare is it that I give a book five stars but readily say, this book isn’t for everyone. But I’m saying that with A Little Life. I loved it. Loved it so much. And typically five stars from me means everyone should read it. Not this one. A Little Life is the story of four men who meet in college and the friendship that grows among them that carries through the next three decades. As the narrative unfolds, the reader understands that Jude, the central figure, is a damaged soul, having endured what are quite literally for him, unspeakable acts of abuse for the first sixteen years of his life. Jude, a “foundling” at birth, adapts into a high-functioning but relationally stunted adult that, perhaps because he is damaged, everyone around him is drawn to. 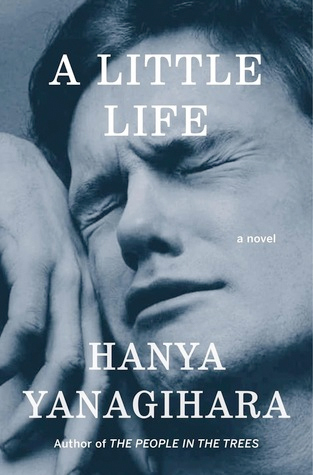 Hanya Yangihara’s writing is elegant. At more than 800 pages, it is neither extraneous or tedious, which is quite the feat. Beginning with the four friends’ embarking on New York City post graduation, she moves through their individual rises to success in various fields – law, art, theater and architecture – while at the same time moving backward, portioning out Jude’s past in just barely digestible bits. A Little Life sets in front of us the very best and the very worst of relationships – friends, lovers, parents. It questions how we define peace or joy or wellness. Ultimately, it begs us to consider if it is possible to be beyond hope. Are some people too damaged to be made whole? This is a book that will wreck you. I was torn with compassion for Jude, finding myself, like the other characters, compelled to try and heal him. I wanted to consume his story, to absorb his pain even as he struggled to find the strength and words to tell it. When I did finish, I knew I didn’t want to stop thinking about it. I found several podcast interviews of Yanagihara which have been fascinating and helped to even out some of my feelings. I encourage anyone who reads it to do the same. For one, A Little Life is too much to read in solitude. But I’m not sure many book groups will want to tackle its literal and figurative heft. Also, it’s interesting to listen to the author give insight into the fairytale nature of the book, juxtaposed its realism. And, the lack of female characters and how it would be a different novel had the same story been told of four women. I’ve had A Little Life on my shelf for about a year now. I bought it soon after it was shortlisted for the Man Booker Award in 2016 (it should have won, no question). But because of its size, I’ve just let it sit – knowing I would get immersed when I finally did pick it up. And indeed, this book will keep you up late and force you to get up early. So pick it up if you dare, but consider yourself warned.